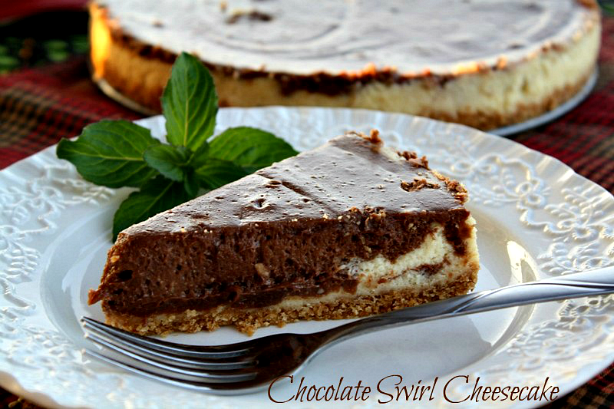 A simple chocolate swirl cheesecake baked in your slow cooker. Now you can enjoy homemade cheesecake without turning the oven on! A couple weeks back I posted a recipe on face book for a cheesecake that was baked in a crock pot. My first thought was you can bake a cheesecake in a crock pot? How cool is that! Well curiosity got the best of me, so I had to make it. 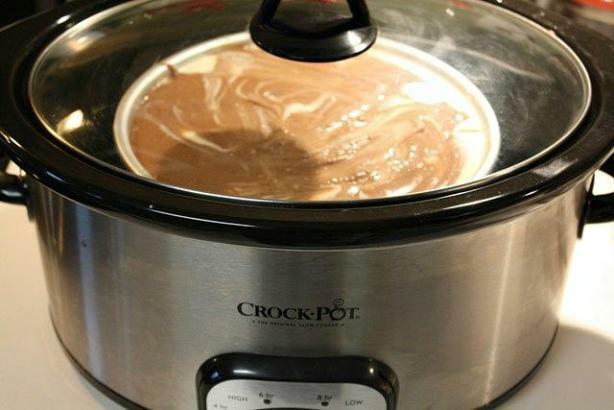 I love using my crock pot for cooking and baking, especially in the summer. The cooking method I used for the Chocolate Swirl Cheesecake is the same method (water bath) I use to cook my overnight oatmeal. This cheesecake recipe only requires 7 ingredients, so it doesn't get any easier than that my friends. I don't bake cheesecakes as often as I would like simply because I just can't bake them correctly. Well what I mean by correctly is without the cheesecake cracking in the middle. I know you can bake a cheesecake using the water bath method in the oven, but I've never tried it. What I love about the crock pot method is that a water bath is still used, but the pan sits on top of the water instead of directly in it. Placing the cheesecake pan above the water allows the cheesecake to steam instead of baking in the water. This method does take a bit longer (3 hours), but it is so worth the wait. 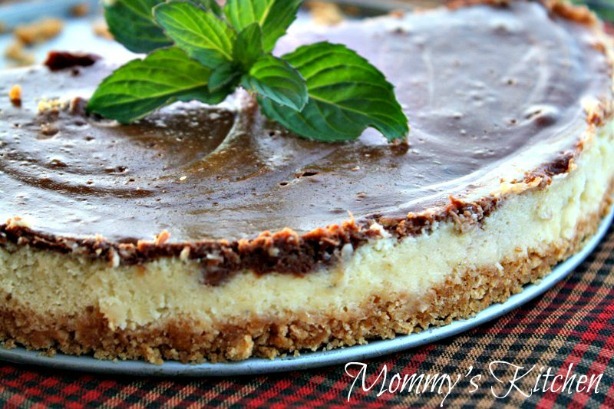 I love that this is pretty much a fix it and forget recipe and the cheesecake doesn't crack!!! This recipe is a winner in my book. Goodness is all I can say because the cheesecake was out of this world good. I can't wait to try a few other flavor combinations and I already have a few in mind. I hope you enjoy the recipe. I have included a step by step photo tutorial. Start by crushing the graham crackers to make the crust. Mix with the melted butter and press into a 7 or 8 inch spring form or cake pan. Set the crust aside and prepare the filling. Using a hand mixer or your kitchen aid mix the softened cream cheese and sugar until smooth. Add the eggs one at a time; add the vanilla extract and continue mixing until the mixture is lump free. Melt the chocolate or white chocolate chips, let cool slightly and add to the cream cheese mixture. If making the swirl cheese cake see the directions below. Add the cream cheese batter to the pan and set aside. Pour 2-3 cups of water into your slow cooker. You want enough water to steam your cheesecake for a few hours and not run out, but not so much water that it gets into your pan (The cheese cake pan fits snug and sits above the water). Place the cheesecake in the crock pot over the water bath. Cover and cook on high for 3 hours or until a knife inserted in the middle comes out fairly clean, and the cheesecake does not jiggle. Do not remove the lid during the cooking process, it needs all that heat! Cover and cook on high for 3 hours or until a knife inserted in the middle comes out fairly clean, and the cheesecake does not jiggle. If condensation starts to build up from the steam you can place 2 paper towels across the crock pot and then place the lid on top. I did not have that problem. Remove cheesecake and set on a baking rack to cool. Refrigerate for 6 hours or overnight until firm. I have also used my 7 quart oblong crock pot (using an 8 inch cake pan) to bake this cheesecake. Start by making the graham cracker crust. Crush 8 graham crackers, and mix with 1/4 cup melted butter in a small bowl. Mix with a fork until just combined, and press into a 7 - 8 inch spring form pan, or something similar. (a 7 - 8 inch cake pan will work really whatever will fit in your crock pot). A spring form pan is easier to remove the cheesecake from the pan. In a bowl blend the softened cream cheese with 3/4 cup of granulated sugar with a hand mixer or kitchen aid. Slowly add 3 eggs, one a time, then vanilla, mixing until thoroughly blended. Continue to beat for three more minutes, creating a smooth lump free mixture. Melt the chocolate chips in a small bowl on the defrost setting of your microwave (about 3 minutes). By Using the defrost setting will the chocolate chips, but not get them too hot. Pour half the cream cheese mixture into your pan, leaving half in the bowl. Pour the chocolate mixture into the remaining batter. Be sure this mixture has cooled slightly to prevent from cooking the eggs in your batter. Drop the chocolate batter by the spoonful into the pan, and swirl with a knife to create a marbled look. Pour 2-3 cups of water into your slow cooker. You want enough water to steam your cheesecake for a few hours and not run out, but not so much water that it touches the bottom of the cheesecake pan or it will get into the pan (The cheesecake pan sits above the water and fits snug). Place the cheesecake in the crock pot over the water bath. Cover and cook on high for 3 hours or until a knife inserted in the middle comes out fairly clean, and the cheesecake does not jiggle. If condensation starts to build up you can place 2 paper towel across the crock pot and then cover with the lid. I didn't have that problem. Do not remove the lid during the cooking process, it needs all that heat! When finished, run a knife along the edge of the cheesecake. Remove the cheesecake from the crock pot and let it cool on a baking rack for 30 minutes. Transport the cheesecake to the refrigerator and store for at least 6 hours or overnight. 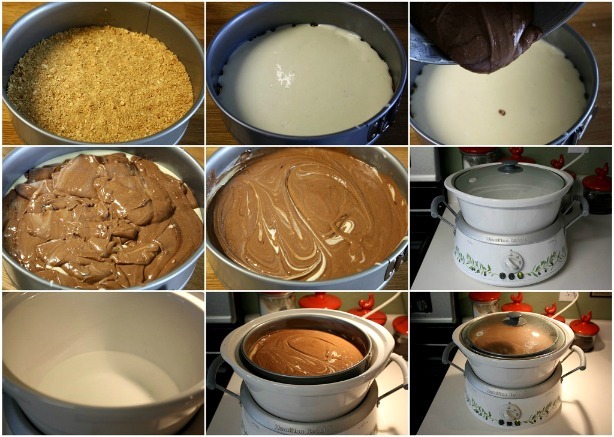 Cook's Note: Here is another method to cook a cheesecake in a crock pot from the crock pot ladies. She uses a bowl and places it directly into the crock pot, and the water is around the bowl. With mine the cheesecake pan sits above the water and steams the cheesecake. I used my 8 - 9 inch spring form pan, but since one side had the latch it made it a bit uneven in the crock pot. I added a piece of rolled up foil on one side to prevent the cheesecake from sitting off balance in the crock pot. I have included recipes for two more crock pot cheesecakes: Crock Pot White Chocolate Strawberry Cheesecake & the Crock Pot Creamy Biscoff Cheesecake. 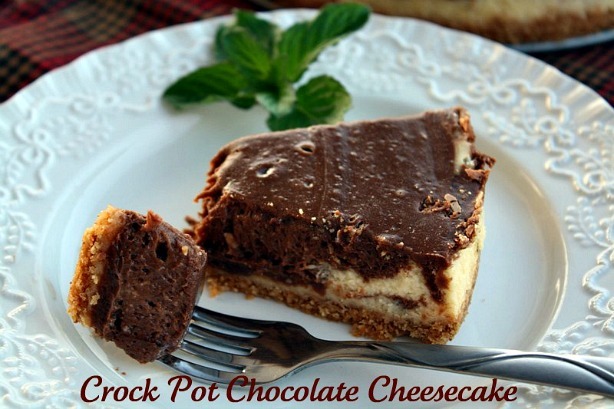 I think it is amazing that you can cook cheesecake in a crock pot! I'd never even considered the idea... I'm so going to have to try it next time I bake a cheesecake. Although it will have to be a small cheesecake as I don't have a very large slow cooker! The best crock pot to use is a round one just like the on pictured in the tutorial. I actually have 2 crock pots a oblong on and the on pictures. I'm sure you could still use a oblong crock pot but the pan may to be only 7 inches round to fit. i think you might have just changed my life--this sounds amazing! I think I need to make one this weekend just because I can! This looks Amazing! I am a Cheesecake LOVER and can't wait to try this out. I would love it if you shared this at my link party (first one ever) www.michellestastycreations.blogspot.com. Have a great day. I would have never in a million years thought to cook a cheesecake in a slow cooker! Pretty neat concept! That looks SO good. I have to make it soon! I hope you don't mind, I gave you an award on my blog. Thanks for linkin' up this week. I can't wait to try this recipe. These look amazing! I would love for you to share with my Linky Party Blog Stalking Thursday. I think my readers would really like these! Thanks for the recipes! Oh My Gosh!! That cheesecake looks amazing! Cheesecake is one of my faves. I'm a dessert addict, so it would be dangerous for me to make it, lol. I did not know it could be done in the crock pot. So I saw your pretty cheesecake and then I read, "Crockpot Strawberry White Cheesecake" and I literally said out loud, "NO WAAAAAAAAAAAY!!!" But then I saw Mommy's Kitchen's name attached to it (I so respect your cooking and recipes...so I came here to check it out). Brilliant idea!!! That's so fun! I can't take credit for the cooking method that came from The Hill Country Cook via 365 Crockpot Meals. I did come up with the white chocolate strawberry recipe and it was outstanding. I just made another version yesterday. This method really makes baking a cheesecake so easy. I hear your pain on the water getting into the foil and the cracking top.I have solved both problems. I grease the inside of the spring form pan and place strips of parchment paper inside. I also found a round silicone cake pan that the cheesecake pan fits right in. No water. Perfect every time. oh my days, what a perfect looking cheesecake!! Hmm? Crockpot, Cheesecake? I never would have thought it could be done but it looks so good. Thank you for sharing. I usually bake cheesecake in the oven in a water bath, but this crock pot method sounds and looks like another great viable option for me to try. Thanks for sharing this wonderful idea and recipe. Sounds like white trash cheesecake to me. If you can't make the real thing, and do it right.. Then maybe you should get the Jello-packaged mix and start there. I debating publishing the last comment or not. It always amazes me when someone leaves rude and ugly comments and then has the nerve to do it anonymously. I mean goodness if you have the nerve to say it why not post it under your real name. The ignorance of people gets me every time. So just because this cheesecake is cooked in a crock pot it's white trash. Hmm not sure how they came to that conclusion. It has all the ingredients of a real cheesecake, but just cooked in a different manner. Well to the anonymous commenter. Think what you want, but there is a whole lot of other people that think differently than you. All I can is if you don't like it than pass the post by instead of being rude. Just because you don't like a certain recipe doesn't that mean someone won't like it. I'm not white trash so your comment is not appreciated. I am just curious how you keep the condensation from the crock pot lid from getting into the cheesecake? @Anonymous, The point of this recipe is not to make it easier by cooking it in a crock pot. The whole idea is not to use a oven period when it's 100 + degrees outside. So it isn't easier, but a different way to cook it. It would all depend on the size of your crock pots opening. You can play around with different size pans and see what fits in what type of crock pot you own. Can I just leave the pan inside the pot with the pan touching the water? As in do I need to let the pan sit on something inside the pot or it is OK for the bottom of pan to touch the crock pot? Ok. I want to try this method but I'm a little confused. When exactly do you put the pan with the cheeesecake mixture? From the picture it looks like it is sitting outside of the crockpot on top. Is that correct? Do you put the pan IN the crockpot or just sitting on the top? Sorry but I don't seem to be able to figure it out! Thanks for the pictures - very helpful! I have the same dish-type crockpot - bought it to serve hot spiced cider at holiday gatherings - and wondered what else I could do with it. Your cheesecake recipe looks perfect for the two of us and I will try it for new year's eve. Tina this looks so good! I really need to try making cheesecake in my slow cooker some time! What a great idea, I would have never thought to use the crock pot as a water bath! My mom and son love cheesecake, can't wait to try this. Thanks for linking up to Whatcha Crockin' Wednesday! I still don't understand how to make it in the crock pot. Just don't see how it fits.